I got so wrapped up in the sugar-free challenge last week I didn’t have a chance to write this post (or about anything else since then for that matter), so here goes. Before Daniel went to Grade R this year Etienne and I had a difference of opinion about his extra-murals. Etienne wanted him to start with rugby/cricket/anything remotely connected to a ball sport and I really wanted him to do Karate. I’m not holding out hope that Daniel will end up being a pro, but I have heard from so many people that karate is a great sport (? ), especially for boys, as it forces them to be disciplined. Amid much eye-rolling from Etienne I stuck to my guns and managed to get away with it. We had his first grading last Saturday and it was quite something. 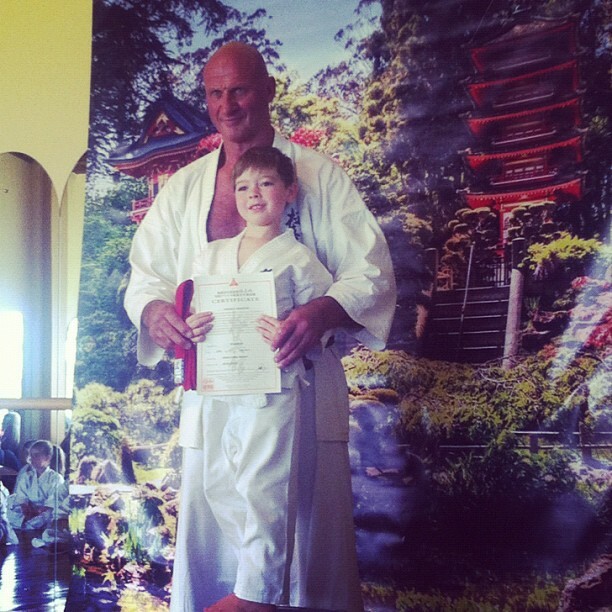 Hennie Bosman’s studio offers the karate classes at his school and Hennie himself conducted the grading. For those of you that don’t live in the greater Cape Town area, Hennie Bosman is a legend. He has had his Karate training school for as long as I can remember and has an outstanding reputation. 1. 40 children stand at attention or sit QUIETLY at a softly spoken instruction from Hennie. They literally jump to attention. 2. He relates to the children in a language theat they understand. He would talk about how you would block the “baddy” if he came at you. 4. The amount of hero worship is quite spectacular. And that’s just the kids. At one stage he was explaining how to do push-ups and rapped his knuckles really hard on the wooden floor. There was a collective intake of breath and reverential hush around the room that made me want to giggle. 5. The guy is really really strong. He literally picked our 25kg son up with one arm like he was a feather. And then had quite a hard time removing Daniel from his leg as he kept on hugging and there was a pile of 6yo boys lined up to do exactly the same thing. So, if you were wondering about whether your child should do karate, don’t wonder. Just do it. Ps: he had his Mozart Music Mouse (Daniel, not Hennie Bosman) “concert” yesterday and I managed to get there during lunch. To see his face light up when he saw me made my heart lurch. I now have to go home and explain to him that all most of the other Mommies are having a party for his teacher at 10h00 tomorrow morning (at school) (during their snack break) and that this Mommy unfortunately has to work. I would rather stick pens in my eyes. Pps: I just googled Hennie Bosman and there is an actual gallery of images of him. Very Jean-Claude van Damme, just without the naffness. Just did a post about kids and sport yesterday and the point, well, as long as they do something. We feel it’s important to live active to counter the weight, eating and “computer culture” our kids are growing up in. So well done! And congrats to Daniel. BTW he and my Princess weighs the same. We are tinking Judo for the boys next year because the SA junior champ teaches at the school and well, Hunter was a silver SA medalist in Judo so I guess it would go with the family way. I can tell you however that at last year’s open day for grade 1 when asked what activities kids should do, the reply was – ideal one team sport, one individual sport and one cultural acticity. But, she added, she can always recognise the ballet girls and karate and judo kids in her class. Because they can follow instructions and already have the discipline to learn ingrained. Thanks Cat, and thanks for the headsup about the extramural, it makes complete sense!